The present invention is a Ball & Jacks playing card game that simulate the Ball and metal Jacks floor game using a deck measuring 2 1/4 inch by 3 1 /2 inch or standard size deck totaling 108 cards in which 80 cards are called Jack cards and divided into 10 suits being 8 one's, 8 two's, 8 three's, 8 four's, 8 five's, 8 six's, 8 seven's, 8 eight's, 8 nine's, and 8 ten's with "28 special cards" being 8 Ball cards, 8 Throw 2 cards, 6 Wild cards, 6 Skip cards and using only pairs and straights causing the card game to be manipulative, challenging, strategic and fun for all adults and responsible age children played by 1 to 4 players. Cards are numbered from 1-10, therefore there are 10 levels of play. Play begin on first level. To end a level a player must match a "Ball card" with that level card, for example, level 1, and call "Ball Jacks' to stop the play." Players caught with cards in hand must deduct the value of each card. If players have spreads, then points caught in players hand can be reduced by subtracting from those spread, if any. Remaining points are added or deducted from any points already scored, if any. The results are players scores for that particular level, plus or minus. After the first level, for example, is completed, the next level is dealt. For example, level 2, level 3 and so on until the 10th level is dealt and completed. Each level must be completed. If no "Ball Jacks" are called, scores are still tallied but that level must be re-dealt and played until "Ball Jacks" are called. Highest score at end of 10 levels win the game. The game is played like poker making spreads but consist only of straights and pairs of like numbers. There are no Jokers, Kings,Queens, Jacks, or A's. No Hearts, Spades, Clubs or Diamonds. Just 80 numbered cards from 1-10 and 28 special cards for a total of 108 cards. Two to four Players play against each other and can make or form as many straights and pairs as they can. Cards are counted and added up by face value of all cards. The Object of the game are players trying to block other players from making spreads using Skip cards and Throw 2 cards while trying to collect a Ball card and level card to be the first to call "Ball Jacks." and get to see other players scream from getting caught with high cards in hand. Players can also play as teams. The team game is played like spades, only much better with many twists using the Throw 2 card or skip cards. Wild cards are worth 10 points and can substituted for any card except forming a "Ball Jacks" call. Ball cards are worth 20 points. Level cards are worth face value. When any of these cards are caught in a loosing player's hand they are added and deducted from player score, if any. If no score it is scored as a minus of that amount. Ball and Jacks playing cards replace the dangerous red ball and metal or rubber jacks for kids that carry a warning of chocking. Our game has neither and is safe for the entire family to play. Now adults can share in the game with children or play against their adults friends for hours of fun. Game play time is about 1 - 1/2 hrs. Game consist of adding, subtraction and multiplying. This is good for children. To start game, at least 4 cheap $1 calculators are require. Chose a score keeper and have players add up their own points on the honor system and present them to the score keeper. Rated by players as one of the best new game for family fun that's challenging, strategic and a whole lot of entertainment and fun.. 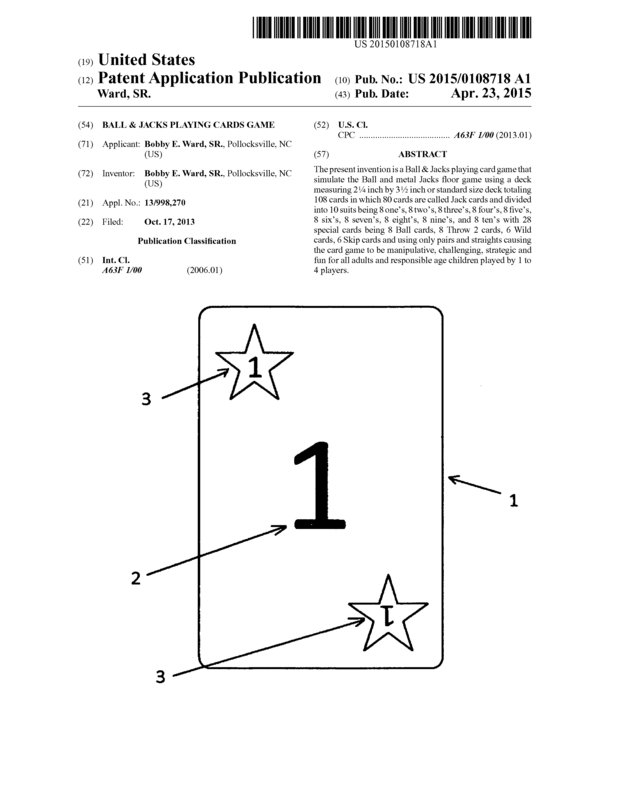 Page created at 2019-04-25 0:23:51, Patent Auction Time.